The touring companies that bring New York’s shiniest hits to cities across America do theater a disservice, in the same way McDonald’s offends the concept of burgers and fries. These polished, generic “Broadway Shows” are often shallow, unchallenging and utterly forgettable – but that’s what sells. So I was pleased to buy a ticket to the National Players production of To Kill a Mockingbird, presented last Saturday night at Rome’s Capitol Theatre. The audience wasn’t large, maybe a few hundred, but they were treated to something special and increasingly rare. National Players has been touring for 65 consecutive years, offering several plays in repertory on each tour. The group’s web site says the company’s goal is to “engage audiences and examine the intersection between great works of literature and contemporary life. Committed to excellence and accessibility, National Players makes the classics current.” The current tour is #66, and includes To Kill a Mockingbird, As You Like It, and The Tempest. A presenter might book one show for the afternoon, another for the evening and the third next day, all performed by the same actors. National Players operates as a bus and truck company – what must must now be regarded as an old fashioned approach. They travel with minimal scenery and the actors often double as stagehands. This means they can perform almost anywhere, and relatively inexpensively. I used to do a lot of lighting for bus and truck shows – a venue would ask me to be the local technical coordinator, and I’d speak to one of the actors a few days ahead of time and hash out the details, then make sure all went according to plan. Despite the demands of being on the road and wearing multiple hats (not to mention knowing several plays at a time), bus and truck shows are almost always energetic, inventive, and inspiring. If you have a chance to see a National Players show, do. Christopher Sergel’s adaptation of Harper Lee’s To Kill a Mockingbird was first performed in 1990 in Monroeville, Alabama (Lee’s hometown). It’s been performed there every year since, on Fridays and Saturdays in April and May. 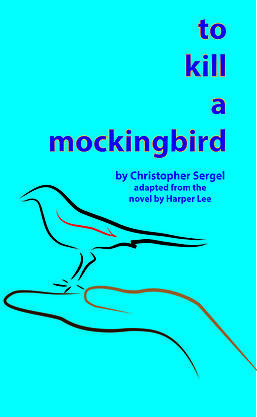 The New York Times reports that the publisher won’t renew the license for 2016, a sad circumstance I suspect is motivated by greed and the upcoming publication of Lee’s Go Set a Watchman (Syracuse Stage and Rochester’s Geva both have productions of Sergel’s Mockingbird planned for next year.) The play is a serviceable adaptation, condensing the plot and keeping its major points; the dialogue is mostly from the novel. What lifts the National Players production is the performers. Most of the ten actors play several parts, which initially took some adjustment on my part – so much of what I’ve seen lately has spelled everything out in very large letters. Once I got used to a 20-something actor switching between a ten year-old boy and a forty-something man, and a six year-old Scout who was as tall as the adults, I was swept away. These are great actors. The part of Atticus, in particular, was well played by Jacob Mundell – dignified yet vital, unshadowed by Gregory Peck’s immortal movie performance (not an easy trick). Unfortunately, The Capitol didn’t find a capable technical coordinator – the lighting and sound for the production were terrible. TERRIBLE. Although we could usually hear the actors, they fought to be heard over a persistent hiss from the speakers. The lighting was incompetent (it might not even have been focused for this show) – some spots were unshuttered, some hard-edged, others soft, with actors sometimes completely unlit. Front instruments were used for general lighting, overhead for color – as a result, the daytime scenes looked dim and flat. The Capitol’s house lighting board was used for the production; it should have been retired twenty years ago, and here ensured every fade was shaky and late. I’ll say it again – the lighting and sound sucked. I wish, I wish, I wish… This production needed a presenter that knew enough to care about technical theater. Here’s the problem – the McBroadway shows all have great tech. By presenting serious material with awful tech, the audience’s tendency to ignore potentially great theater is reinforced. National Players, the audience, Harper Lee and the Muses all deserved better. Posted in Theater and tagged National Players, Theater, Theater Reviews, To Kill a Mockingbird. Bookmark the permalink.